Soon after Millie was born (June 11, 2000), we knew that something was wrong. With her mother unable to care for her special-needs baby, Millie would need to be hand-raised by human caregivers. Millie was diagnosed with cerebral palsy. Her developmental needs were so great, doctors were not sure she would live. But with the love and dedication of her caregivers, Millie thrived. In the process, she touched all around her. A born charmer, Millie got the special care and extra attention she needed from her devoted human family and even physical therapists from Easter Seals. With her adorable face and eagerness to learn, Millie was truly inspirational. Surpassing expectations, Millie learned to walk, climb, feed herself, and even play like other orangutans. She loved children’s toys, and she loved to be tickled! Her smile lit up the room. A brave girl who never knew she was different, Millie stole our hearts. Millie passed away peacefully in her sleep on February 19, 2004. The Miss Millie Foundation was born from the love that Millie shared with all around her. In her name, those inspired by her life strive to bring happiness, enrichment, and assistance to other orangutans in need. Orangutans are very curious and intelligent animals. 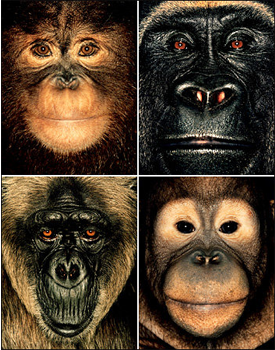 They are part of the great ape family, and are the only exclusively Asian living genus of great ape. Orangutans struggle to survive because of the imminent threat that humans pose to them. Everyday, the rainforests in Southeast Asia are destroyed and replaced with palm oil plantations, and it is this deforestation that is costing orangutans their habitat and lives. The World Wildlife Federation estimates that there are approximately 7,500 Sumatran Orangutans left in the wild, putting them on the critically endangered list. 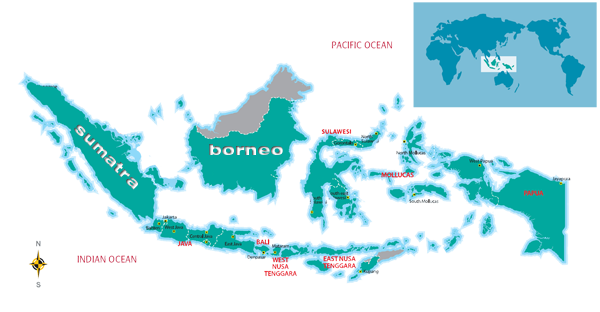 The Bornean Orangutan has a population estimated at 41,000 making them Endangered. It's a jarring statistic for most people the first time they hear it. To think that all of the orangutans in the entire world couldn't even fill a football stadium is terribly sad. We hope that we can help the visitors to our site and supporters of the Miss Millie Foundation better understand their plight and support the efforts to rectify it. Hey Kids! 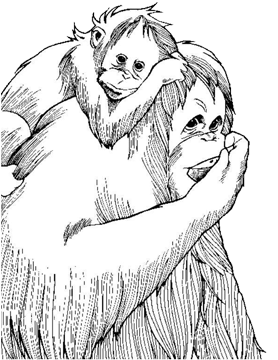 Download one of our orangutan coloring pages and bring it to life for us. We would love to see your finished product. Send it to us by email and we might just put it on our homepage as the picture of the week!